30-year old San Pedro bartender, Edwin Ixpatac died on Monday, March 7th after being on life support at the Karl Heusner Memorial Hospital (KHMH) in Belize City. It was reported that Ixpatac had sustained injuries when he was detained by police on Thursday, March 3rd. 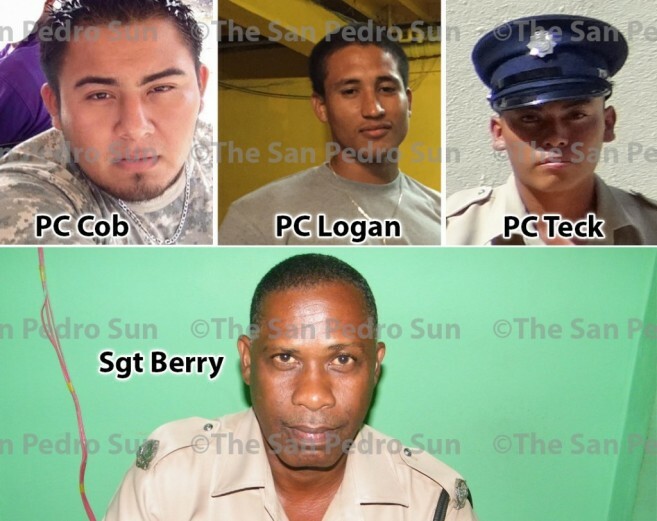 As a result, three San Pedro Police officers, PC Jahisir Cob, PC Rommel Logan, and PC Reydel Teck have been officially charged with murder, while Sergeant Raymond Berry has been put on interdiction. The initial reports are that around 2AM on Thursday, March 3rd, San Pedro police responded to a call about a person struggling in the water near a resort just south of San Pedro Town. According to reports, police recovered Ixpatac from the water, who was intoxicated and had sustained injuries from washing against a sea wall. The report continues to say that Ixpatac was combative, and apparently kicked and struck at the officers who were assisting him. He was then taken to the San Pedro police station where he was detained overnight. The following day he was taken to the Dr. Otto Rodriguez San Pedro Polyclinic II in a critical condition. Due to this grave state, he was later transported to KHMH in Belize City, where a three days later he succumbed to his injuries. According to police, the sergeant in charge that night made a poor decision in not immediately taking Ixpatac to the polyclinic. Reports also indicate that Ixpatac had been abused while in custody. San Pedro police officers recently participated in a class called, “Care and Custody of Prisoners” where they were encouraged to treat detainees as if they were their brothers. “It is so disturbing that after all attempts to educate our officers, something like this can still happen. We absolutely will not tolerate abuse,” stated a police source. The San Pedro Police Department will not entertain such behaviours from its officers and thus, have prosecuted the responsible individuals for the death of Ixpatac. The police assure the general public that they will continue working together with the community, and even though this incident has created concerns, island residents can rest assured that local law enforcers can be trusted. Edwin was born in the Guatemalan community of Ixlu, located in the department of Peten. At the age of eight, he and his family moved to Belize and settled in the community of Seven Miles/El Progresso in the Cayo District. Edwin was the oldest child of the family. Bartending was always his passion, and after mastering the trade he ventured out of his home town and worked in several recognized establishments of the tourism industry. His career in the mixology area did not just take him just across the country, but to La Isla Bonita which was one of his favourite places to work. He spent the last five months of his life on Ambergris Caye, where he moved after separating from his common –law wife with whom he had a four year old daughter. He began working as a bartender at the Caprice bar of the well- known Holiday Hotel, where he charmed everyone with his professional, friendly service. According to Romero, Ixpatac had make plans to be off the island at the end of the month (March) to go and celebrate his daughter’s birthday. Back at his Seven Miles home, Fernando Ixpatac, Edwin’s younger brother says that the family will greatly miss him. They cannot get over the idea that he is gone. “He would always come visit us since he left home to pursue his career in the hospitality industry. Edwin was always there for us, he was the brother you always wanted to be around with,” said Fernando. Funeral services for Edwin’s burial will take place on Wednesday, March 9th in his hometown of Seven Miles in Cayo. A solidarity walk in his memory is to take place in San Pedro Town this week, and his family members are planning to attend. The date is yet to be announced. Our deepest condolences to his family and friends. Here at The San Pedro Sun, we will miss his warm smile and soft-spoken ways.